I've been busy playing with the new Petite Baby Shower stamp set and couldn't resist stamping a rainbow troop of elephants. The mix-and-match nature of the stamps meant that the hardest and most time-consuming part of this card was deciding which design of elephant and elephant ears to stamp! I traced over the eyes of the elephant with a fine-line pen to provide a more contrast against those fun polka dots. It makes so much difference! 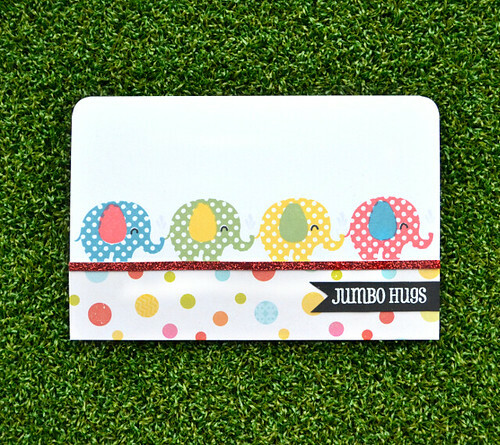 When it came to stamping the elephant ears, I decided to use the same inks but swapped the colours around on the elephants to add a little fun to the design. Don't forget to pop across to Stephanie's to check out the full release today, find links to the rest of the fabulous Design Team sharing their final sneak peeks, and to make your shopping list for tonight! As always, it's a fabulous release containing something for everyone! Thank you so much for visiting my little corner of Blogland today! I'd love to receive such fabulous hugs !